We facilitate public and private retreats. Come and be inspired to allow the splendor of your destiny shine into the world! Our public retreat offerings are usually limited to a group of 6 to 10. You are invited to text or call (415-706-9320) for details. Or call if interested in setting up a retreat for an individual, a couple or a small group on another day. Discover the depths of Animal Guardianship. Discover the healings that come with Wholeness Consciousness. Discover and live a deeper Soul Relationship with your animal friend. 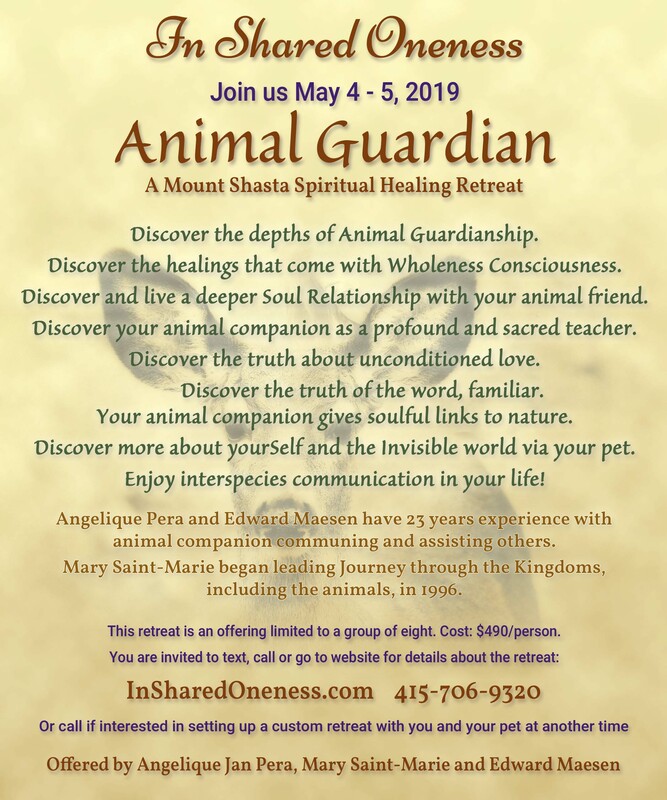 Discover your animal companion as a profound and sacred teacher. Discover the truth about unconditioned love. Discover the truth of the word, familiar. Your animal companion gives soulful links to nature. Discover more about yourSelf and the Invisible world via your pet. Enjoy interspecies communication in your life! 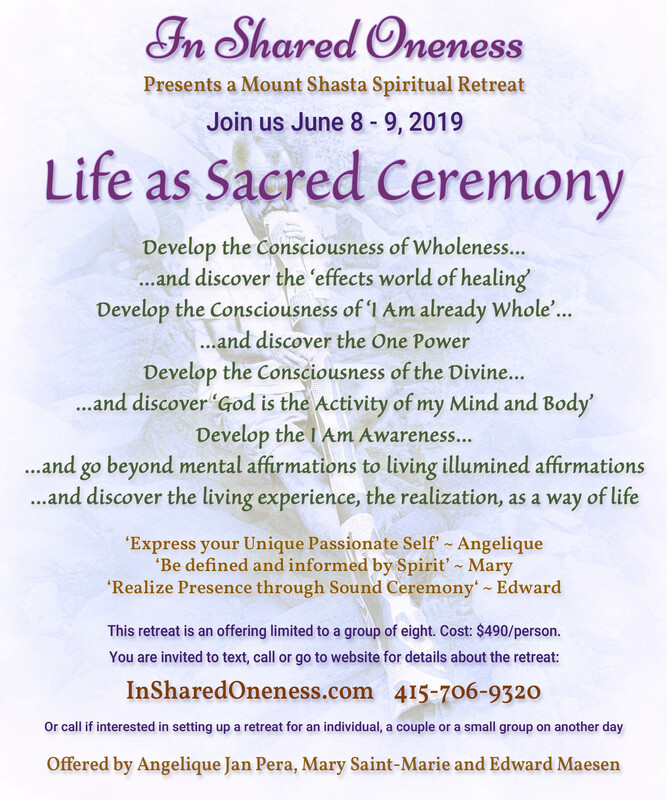 For more information, to determine if this retreat is a fit, and to register, please call Angelique at 415-706-9320. Or call if interested in setting up a retreat with you and your pet at another time. Let three WayShowers hold space for you. Our work together starts the moment you commit to come and register, and you may begin to notice shifts in your life. The retreat time itself is a period of dedicated and accelerated growth and unfolding. The adage "where two or more are gathered together" is experienced here. Old disruptive patterns start to dissolve and new directions of clarity are seen. Or call if interested in setting up a private retreat at another time. In Shared Oneness invites individuals around the globe to participate in a daily meditation. The Daily Global Meditation is a call for peoples around the world to participate in a short daily meditation or prayer at 8 o'clock in the evening (8:00 PM or 20:00) local time. If 8 PM is an inconvenient time, one may choose any other hour of the day and align with individuals for which that hour is their local 8 PM. One doesn't need to be an experienced meditator to join. We suggest a focused attention daily for 5 minutes, to envision the Earth and Sky as Illumined and Whole. Visit DailyGlobalMeditation.com for more information. We offer customized retreats by request, for individuals, couples, families and groups (adult or youth).